New digital technologies have opened a new era of sound editing. It’s no longer field for professionals only. Now, almost every PC user – whether he’s a writer from Buzzessay, a businessman from Entrepreneur, or an amateur from any other industry – can apply effects to audio files. Moreover, there are a lot of online services that allow working without installing any software. However, the traditional way of editing (that is, by using software) provides much wider opportunities. Although such programs may contain excessive functionality, many users prefer them to online ones. Let’s review the most convenient programs and online services, according to Design Contest. It’s ones of the best free music editors. Wavosaur does not require installation and does not change the registry. A distinctive feature of the editor is the ability to track detailed presentation in 3D mode. Wavosaur supports the most popular formats: MP3, OGG, WAV, AIF, and AIFF. It has highly flexible options for transcoding between signal formats, an unlimited number of tracks for editing, and the ability to process tracks in real time. A significant drawback of the editor is that it supports only Windows 98, Windows XP and Windows Vista. Thus, it’s suitable for conservatives only. 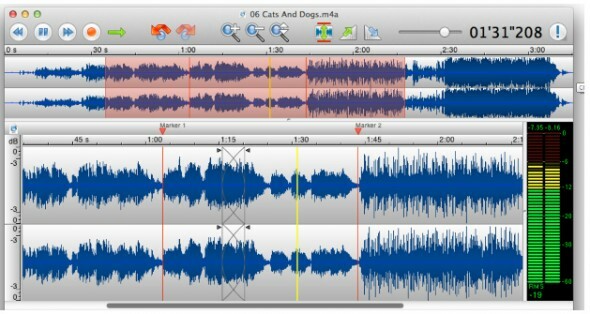 The first version of the software became available to the public in 2000, and now it’s one of the most widespread audio editors. Since 2000, Audacity is constantly developed and improved. The latest version of the software was released on Jan 20th, 2016 (added ‘Spectral Reassignment,’ introduced Improvements to Pitch (EAC), spectrogram settings are now available for each track). Audacity is free and provides enough features for novices. It can read and write multiple formats and various codecs, including MP3, MP2, Ogg, MP2, AIFF, and WAV. The wide range of possibilities for the audio signal transcoding allows you to re-encode any source file into any format supported by the program. Among other features, it’s worth mentioning an unlimited number of tracks for mixing and many additional effects and filters. Unlike previous editors, Audio Editor Gold is paid. Trial access is limited to 30 days and constantly pop-upped reminder window. However, it features a friendly interface and the ability to edit tracks on the wave model that can be scaled for more precise selection of the track sections. Also, you can edit a separate channel. The software provides free transcoding between all supported formats, including WMA, MP3, WAV, and Ogg. If you have no time and desire to install and learn the software above, then you’re welcomed to record and edit audio directly from the browser window. A decade ago, recording online was something out of science fiction, but now it’s possible! 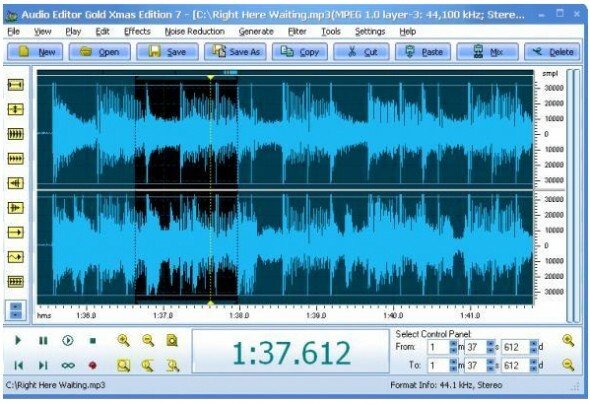 This service turns music editing into a simple process that takes a minimum of time. You can get the desired segment of the composition in three steps: open the file, determine the track segment and download it. Online MP3 Cutter supports five formats: MP3, WAC, AAC, AMR, and Apple CAF. It is very convenient to use for cutting music and re-format audio. The program is free. The simple and intuitive interface is perfectly suited for everyday use. The service offers abilities to cut, recode, and add a filter to the audio just in your browser. TwistedWave provides about 40 VTS-effects, damping effects for the whole track and its parts, and transcoding/saving the finished track in the cloud. TwisedWave supports a variety of formats (Ogg, MP2, MP3, FLAC, WAV, WMA, Apple CAF, AIFF, and AIFC) and easy transcoding. Also, you can set the bit rate (from 8 kb/s to 320 kb/s) for a record. Free treatment is available only for the mono mode. It’s a convenient online service for creating ringtones. Unlike Online MP3 Cutter, it has 16 effects that can be applied to records and supports 6 audio formats: MP3, MP4, OGG, AAC, MPC, and M4R. You can save the finished file on a PC and a mobile device. Make Your Own Ringtone can be successfully used as a music converter. All supported formats can be easily converted. Thus, it’s not necessary to cut the song – you can just save it in the format you need. Soundation is a full-fledged sequencer where you can work with audio files and create music. The free library has a few samples and effects. You can work without registering, but to save projects, you need to create an account. 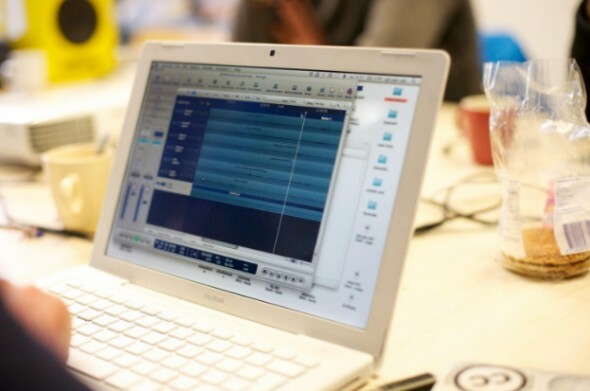 In short, Soundation is a perfect online service for recording. I recommend it to those who want to work on their audio podcasts online. For example, you can record voice at home and then edit it in the office. You do not have to carry a file on a flash drive – the project will be stored on the server. Brian Jens is a generalist from DesignContest. Not just a designer and blogger, Brian has a lot of interests and experiences in various fields. He constantly stays in touch with his reader, so you’ll get a very fast response to your every query. Feel free to share your ideas with the blogger, and receive an in-depth article on a chosen topic.